In this paper, we describe system and approaches of our team NimbRo@Home that won the RoboCup@Home competition 2013. We designed a multi-purpose gripper for grasping typical household objects in pick-and-place tasks and also for using tools. The tools are complementarily equipped with special handles that establish form closure with the gripper, which resists wrenches in any direction. We demonstrate tool use for opening a bottle and grasping sausages with a pair of tongs in a barbecue scenario. We also devised efficient deformable registration methods for the transfer of manipulation skills between objects of the same kind but with differing shape. Finally, we enhance human-robot interaction with a remote user interface for handheld PCs that enables a user to control capabilities of the robot. These capabilities have been demonstrated in the open challenges of the competition. 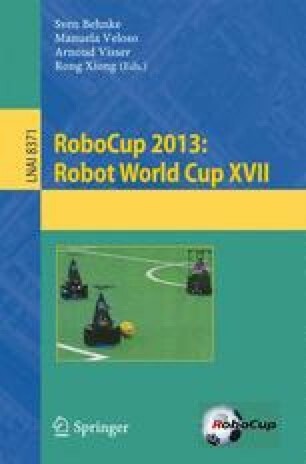 We also explain our approaches to the predefined tests of the competition, and report on the performance of our robots at RoboCup 2013.